Discover why a raven is like a writing desk in this Mad Hatter hat! The licensed accessory features an attached, orange wig with crimped hair for a look straight from the movie. The hat itself is brown with green and dark brown accents. Three patches are attached to the sides that consist of a peacock feather, stripes and "10/6." A coral colored scarf wraps around the crown and hangs in the back. It measures 8 1/2" tall and is made from foam to maintain its shape. The circumference measures up to 23" and can be made smaller, down to 20", with the interior size adjuster. 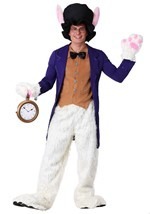 An excellent addition to any of our licensed Mad Hatter costumes!